We are big fans of the sandwich in general. Bier Kraft in Brooklyn makes some of the best sandwiches around, and their Shameless Ice Cream Sandwiches are no exception. 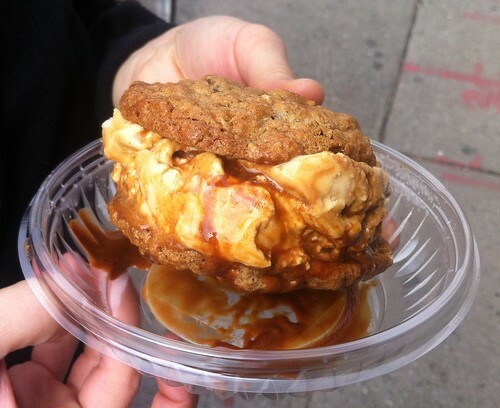 They use Il Laboratorio Del Gelato and smash it between two homemade cookies, brownies, or blondies. 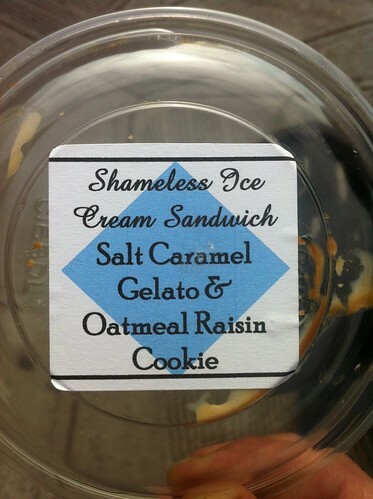 On our most recent visit, as an appetizer to normal sandwiches, we shared the Salted Caramel Gelato & Oatmeal Raisin Cookie sandwich. While we would typically reach for something chocolate, and avoid the raisins, this sandwich was the right decision. Bier Kraft makes it pretty difficult to find a better frozen treat. I thought ice cream on bread seemed strange until recently when my friend, Katrina, sent me a link to a Sicilian ice cream sandwich which held gelato between a sliced brioche roll. Upon doing a little research the first ice cream machine was invented by a Sicilian man in 1686. Maybe the first ice cream sandwiches really were served on bread. My mind is now spinning on what flavor should be placed on a freshly baked brioche roll. Any suggestions? * Ice Cream history courtesy of Food Time Line and Wikipedia. This entry was posted in Reviews and tagged bier kraft, Brooklyn Homesteader, history, Hong Kong Honey, ice cream sandwich, il laboratorio del gelato, Melt Bakery by Tom. Bookmark the permalink. My personal favorite when in Sicily is the lemon granita (lemon ice) on the brioche. But pistachio is pretty good too I think.